We are headed to Disney World in a just a couple days. Eek! So I have been trying to clean out my fridge. That is how this Quinoa & Brussel Sprouts with Balsamic Glaze came about. It’s so delicious! I love when you can make a good meal out of the extras in your fridge. I think you could probably add many other vegetables to this as well. I think carrots, sweet potato or squash would be great additions as well. I always keep some kind of cooked grain on hand in the fridge so I can add it to meals throughout the week. 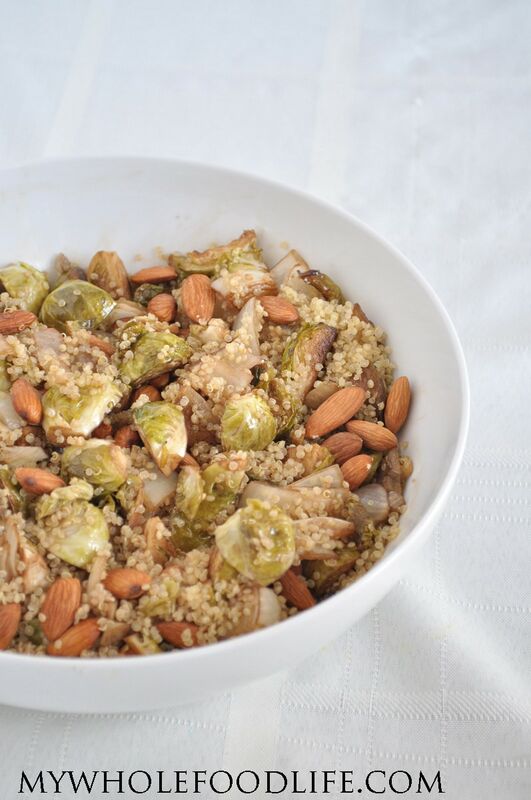 This Quinoa & Brussel Sprouts with Balsamic Glaze is gluten free and vegan. 🙂 If you have been wanting to try quinoa, I highly recommend this. Another favorite quinoa dish of mine is my Quinoa, Tomato and Avocado Salad. I also use quinoa in breakfast recipes like my Slow Cooker Breakfast Quinoa. Roasting the Brussel sprouts, onions and garlic in the balsamic glaze helps them develop a sweetness that is so yummy! I added almonds for a nice crunch and an added protein boost. I wanted to add hazelnuts, but I was out of them. Honestly, I think just about any nut will do in this recipe. A flavorful meal made of leftovers! Rinse the Brussel sprouts, remove the ends and cut into quarters. Add them to a bowl with the chopped onion and garlic. In a small bowl, whisk together the balsamic, oil, maple syrup and sea salt into a dressing. Pour the dressing over the vegetables and mix until everything is coated well. Bake for about 30 minutes, stopping to flip everything halfway through. On a separate baking sheet , roast the almonds for about 8 minutes. Add everything together in a bowl with the quinoa and mix well. I am heading my local Farmer's Market this morning (only a couple more this season). 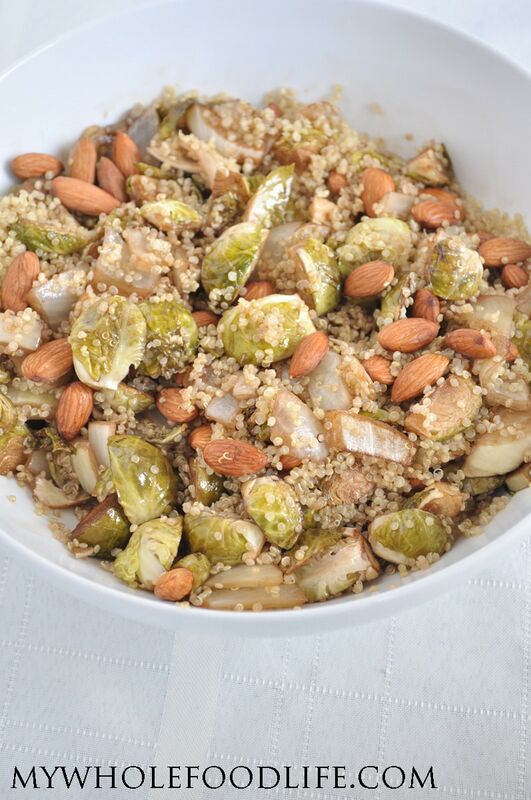 I know there will be Brussels sprouts - so look forward to making this dish over the weekend. Sounds like the perfect accompianment to the butternut squash I will be roasting. My nut of choice for this will be roasted pecans. This is the first time I have noticed a recipe calling for Avocado oil, which I have used fairly regularly since bringing home a nice big bottle from So CA this summer. Thanks for another great recipe! You're welcome! Pecans will be delicious in this too! Hi Melissa, turns out i didn't have quinoa so I used Farro. Also used the pecans, I served over roasted butternut squash lightly drizzled with maple syrup. It was absolutely delicious! I'll be making this for sure! Thanks for sharing! Hello, I've been making a lot of your recipes. I love them, they are great and always easy with not many ingredients, and I love that! How many people is this recipe for? Thank you. I just made this recipe with pecans and it is absolutely delicious! This will be a weekly staple in my house. Thanks for sharing! You are so welcome Megan! So glad you liked it! I make it often as well. I made this dish for the first time this week and have been eating it for lunches at work. It's very tasty. Thanks Melissa! You're welcome Tisha! So glad you liked it!